I get very suspicious when the words “fat free” and cake are used in the same sentence. They really don’t belong together and when they are, I get worried. There are so many fat free desserts out there but most loaded with trans fats, hydrogenated oils and artificial ingredients. So basically, all you’re really doing is clogging your arteries to save a few calories. Don’t get me wrong, there are many healthy guilt-free sweets out there, but I honestly believe it’s better to indulge in the real stuff as long as you do so in moderation. So many Americans (mostly girls my age) have become obsessed with anything labeled “skinny”, “guiltless” or “sinless”. Don’t let those marketing jerks fool you. If you want a freaking brownie, have a small one. Nobody is going to force feed you an entire tray of them. Now, with all that said I discovered a perfect compromise to satiate any sweet tooth. I would love to take credit for this one, but the recipe has been floating around the web for years. I actually have no idea who came up with this but if I did I would give them a pat on the back. 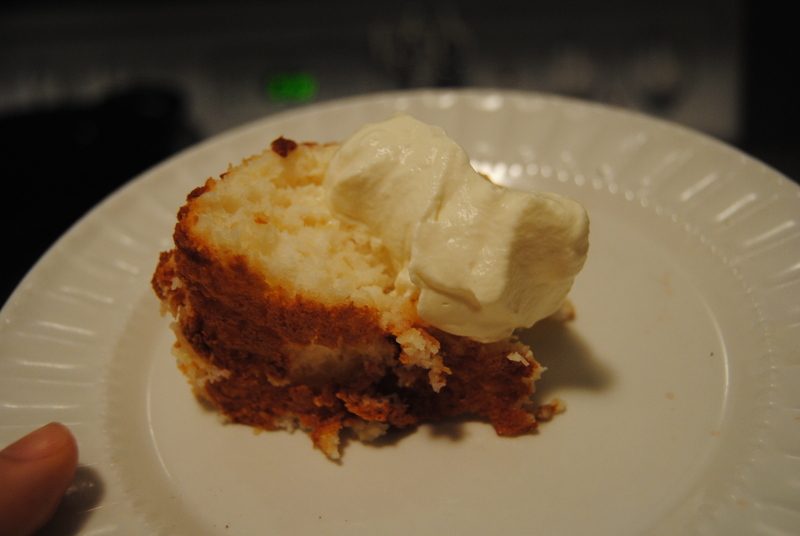 It’s basically two ingredients: angel food cake mix and a can of pineapple. Cheap, easy, healthy– perfect. Boxed cake mixes sometimes freak me out, mostly because you can’t even pronounce half of their ingredients, so I opted for an organic cake mix. It was only 75 cents more. I also bought crushed pineapple in it’s own juice, NOT syrup. As if this could get any better, I went completely Betty Crocker and made my own whipped cream (1 cup cold heavy cream and 2 tbs sugar, whip with hand mixer for 5 minutes). Preheat oven to 350. Use a bundt pan but do NOT grease it. Mix pineapple and cake mix in large mixing bowl. 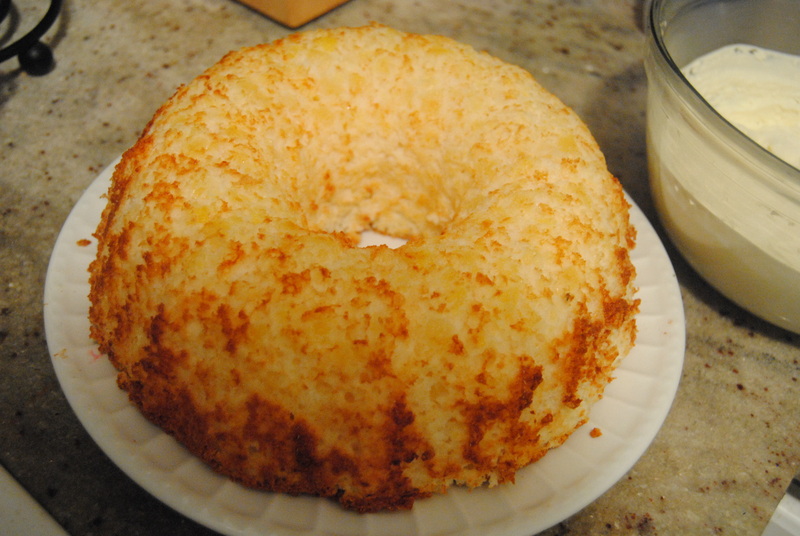 Pour batter in to Bundt pan and bake for 32-35 minutes. Let cool before serving.